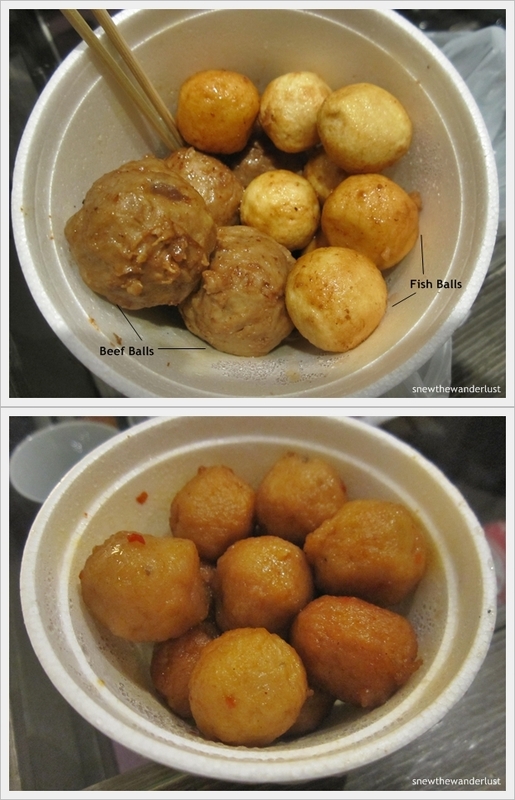 Fishballs, better known in Cantonese as 鱼蛋 (yu dan), is a common snack along the streets in any part of Hong Kong. 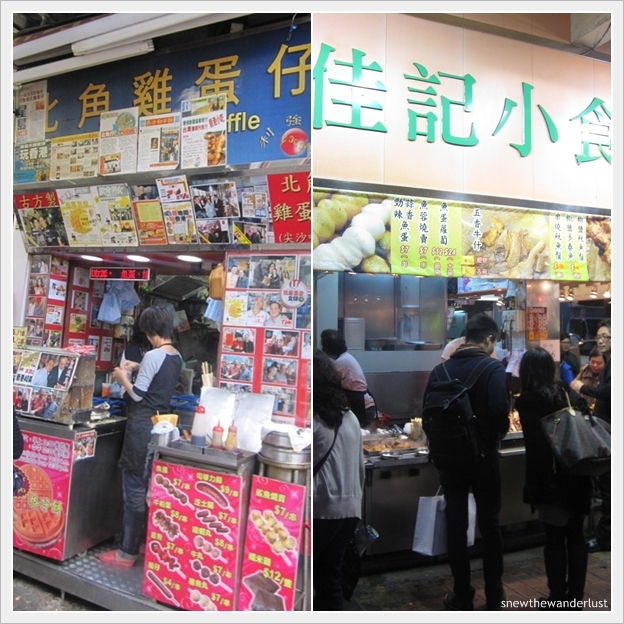 Street stores like this would sell fishballs and something similar to our Yong Tau Fu in Singapore. I saw a number of locals ordering Yong Tau Fu combination for take-aways. But for me, I only like the fishballs as they just taste different and can be eaten as a snack or supper. The fishballs are more chewy then the ones in Singapore. I guess the one in Singapore are made using a lot of flour? You can choose between the spicy and non-spicy ones. If you do not indicate, they will always give you the spicy one. The spicy ones are really too spicy for me. It gets into my throat so much that I start coughing away. It doesn't seem hygienic when the stallholder is always mixing the different pots of boiling soups and soaking the fishballs here and there. Somehow I wonder how long the pot of water has been left boiling there. Is it from the beginning of the day, or previous days? Hmmm... I try not to think further. Anyway, it doesn't matter when I didn't get a tummy ache, and the fishballs are yummy. Other than fishballs, beef balls are also very popular. The big dark ones are the beef balls. Ms Sumo like to try the squid, so we order a stick of bbq squid. The done-ness of the squid is just nice. Not too tough or raw. Another day, Ms Sumo decides to try thesmelly toufu 臭豆腐. I guess Tiny Gal just can't stand the both of us, who's always eating and eating. I still prefer the smelly toufu in Taiwan. The Hong Kong style one taste like just any fried toufu, but with an added purgent smell. Whenever I go Hong Kong, I will not miss the egg tarts from Tai Cheong Bakery. The egg tarts are just so fresh and irresistible. The egg tarts are usually freshly-baked from the oven. I have always prefer the pie-crust egg tart over the flaky pastry crust. Perhaps that's the reason for my preference for Tai Cheong's egg tarts. It's rich in taste, yet not very crumbly when I put into my mouth. It's best eaten warm, just fresh from the oven. Tai Cheong Bakery made headlines in newspapers a couple of years ago, when the landlord increased the rental exorbitantly. When everyone thought that they would close down permanently, the queue was longer than the bee line. The shop was closed, but a new shop was re-opened just opposite the road. The new shop is now revamped with a modern touch. Somehow, I miss the traditional bakery that I once visited. Psychologically, I feel that egg tarts from traditional bakery taste better. Someone from the internet says that the new shop and branches are new and re-branded. Not sure if it's true. But I realise that Tai Cheong Bakery now belongs to the Tao Heung Group of restaurants. Check out the other branches here. But of course, I would still prefer the original store at Lyndhurst Terrace. 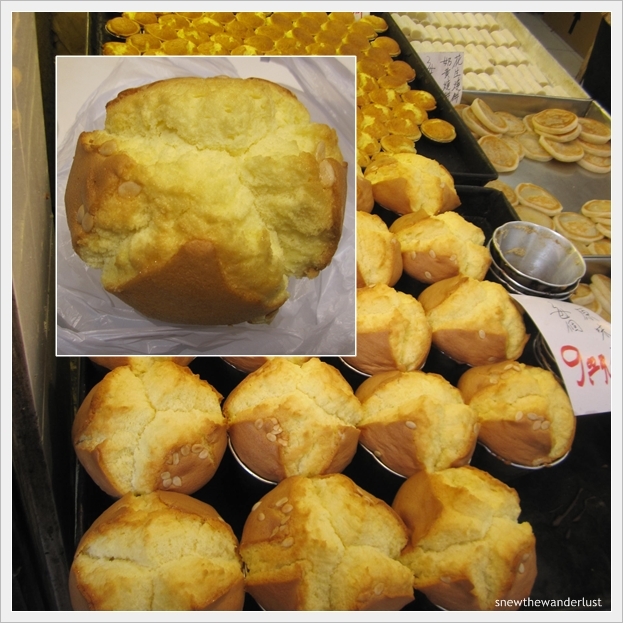 We chance upon this bakery while search for the right directions to Fa Yuen Street. I admit that I do have a fetish for such traditional bakery as it is almost non-existence in Singapore. I get really excited when I see one, especially there are people crowding around to buy. Even when I do not know how it taste, I would still give it a try. The sponge-cake looks good. Cost only HK$9 for one. They are not mini-ones, quite a decent palm-size. Turns out that the sponge cake is really soft like cotton. So yummy! Again, we chance upon this while we finally arrived at Fa Yuen Street. As I'm rushing for time, I didn't really have time to try out the bakery or take more pictures. That also meant I'm returning to try it the next time. I was told that 雞仔餅 (literally translated as chicken biscuit) made of 南乳 beancurd sauce and 牛耳仔 (literally translated as cow's ear biscuit) are the two most popular items for the shop. Anyone who has visited this shop, do let me know your review. Tai Cheong Egg Tarts is also known as "Fei Pung Egg Tarts". Fei Pung refers to Chris Patten,the last Hong Kong Governor. It was known that he will queue up during his tea break for their egg tarts.Whenever he is back in Hong Kong, he will go for the egg tarts.